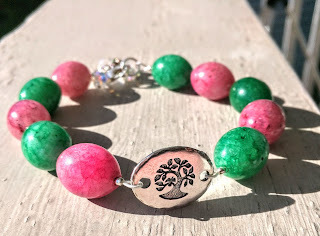 Pink and green Watermelon Tourmaline bracelet with 'Tree of Life' charm, Swarovski crystals and Sterling Silver clasp. 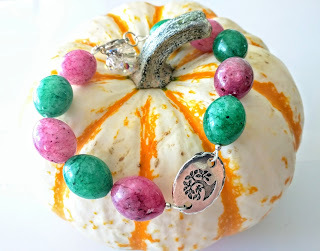 Very bright and pretty colors of natural stone will go perfectly with a day or night outfit. Imagine how rich and vibrant it will look draped around your wrist, and it's sure to bring you many compliments! Swarovski sparkling crystals will add a bling to your day! The bracelet is 8" long for a comfortable fit. 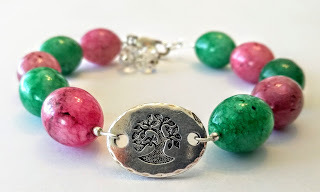 For $84 you'll receive this bracelet in pretty, ready-to-give packaging. Thank you for shopping and have a wonderful day!